Scandal point, as seen from the Ridge, Shimla is a photo perfect place. The most appealing feature of the scandal point to is a statue of the Indian freedom fighter Lala Lajpat Rai . Just besides the Scandal Point is the General Post Office, Shimla. Opened on the 30th of May, 1887, Gaiety Theater is located on the Mall and today it is a major hub for social gatherings. Many youngsters spend their evening at the Gaiety Theatre. Many Schools in the region host their major events at Gaiety Theatre. Recently, the theater has been renovated even after which the original look is maintained. The heritage preserved here makes it more attractive. Built back in 1845, the temple is dedicated to the goddess Kali. It is known to be an ancient temple of Shamla Devi . A wooden image of the good is worshipped locally. It is a very holy and respected place of the region. In addition to the surrounding architecture, The Municipal Corporation building of Shimla is an addition. Preserved in its original form since its establishment, the building is architecturally fantastic. The building has a grand entrance and is worth a look. 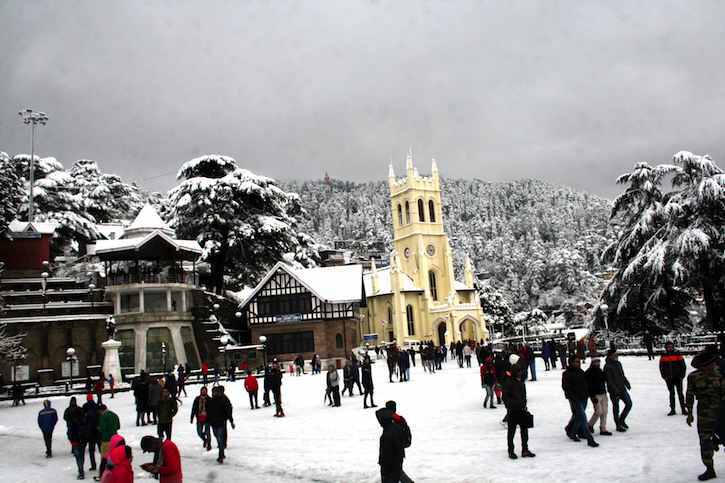 SO pack your bags and get going to Shimla! You can hire a taxi to avoid hassle on travel. Keep Travelling! PS: For comfortable, safe and reliable journey choose AHATaxis for your outstation travels. Next Post Want to enjoy your Himachal Trip? Hire a Taxi!